I have been bombarded with questions from people on both sides of the Atlantic (blog friends, Hungarian friends and family, Canadian friends and family . . . I know the woman at the bakery is dying to ask), all wondering how I’m “coping” with more than three months away from Handy Hubby. I think it’s mighty strange to some (namely the woman at the bakery) that we’ve been apart for so long, so Hubs and I have both taken a stab at answering what life without the other has been like. Me first. favorite pirate t-shirt (he has more than one). He’s using my Dora the Explorer pencil. Awwwwww. Okay, so is it really weird I just took off for a third of a year to do research abroad? I admit, I was apprehensive at first, but now I feel really weird that it doesn’t feel weird and that’s making me feel weird. (I also always got stressed before exams only because other people were stressed and it became distressing that I wasn’t stressed). that. Don’t want him to feel unneeded . . . But remember, for this trip I had the added bonus of being really busy and, until recently, having my Mom around! I also think it’s always easier to be the leaver than the leaved (left? levee?). The person who goes has distractions and adventures. The person left behind gets to sit across from an empty kitchen chair and stare longingly at snippets of proof the other person was there, like clothes in the laundry hamper, bills not filed, a pumpkin cheesecake you baked for them because it’s their favorite not eaten . . .
said, “you’re going to have such a great time!” and he was right. I’ve missed him (of course! ), and I’m really looking forward to seeing him soon, but these past months have been exciting and challenging (in a good way). Have you spent a good chunk of time away from your spouse/partner/roommate/plants? I went for coffee with a Hungarian friend last night, who had spent three months in the U.S. during the summer. She said folks really criticized her for leaving her partner behind. Check back tomorrow to read Hubby’s thoughts (spoiler: he was traumatized by having to grocery shop alone). I just spent a week out of the country on a work trip. The day after I returned, my husband left for a week. I think it's good for people to miss each other every now and then.And I think it's really good for me to get to go to bed when I want and eat what I want and not to have to think about anybody else. I am selfish that way. Oh gosh, I wanted to talk about that too!! Hubby was really gloomy when I left and I said, hey, buy food I hate, watch shows I hate and do what you want!! I thought it was a good opportunity for him to be "him," because I can, without trying, be a bit bossy about stuff (like cleaning). I completely agree with absence making the heart grow fonder as well. It helps keep us from taking the other for granted, I think. I think in the great span of things, you have a lifetime to spend together- 3 months is a (difficult, scary) blip on the radar and it's awesome to have so much trust and respect for one another that you don't hold each other back. My fiance and I work really hard at that as well, to make sure we each have our own "thing" that's just for us so that while we're sharing literally everything else we can still feel some independence. I have all my DIY projects and blogging, he has his movie and music collection and writing. That is so true! Before the trip, 3 months seemed like forever. Now, I can hardly believe that it passed in the blink of an eye. I keep pushing Hubby to have more hobbies of his own. I have encouraged him to travel alone, join a club alone, anything to give him some space from me too.I love that your fiance writes! Does he share his work with you? That is so exciting!!! I wish him luck on the book. You are so sweet for editing his work. 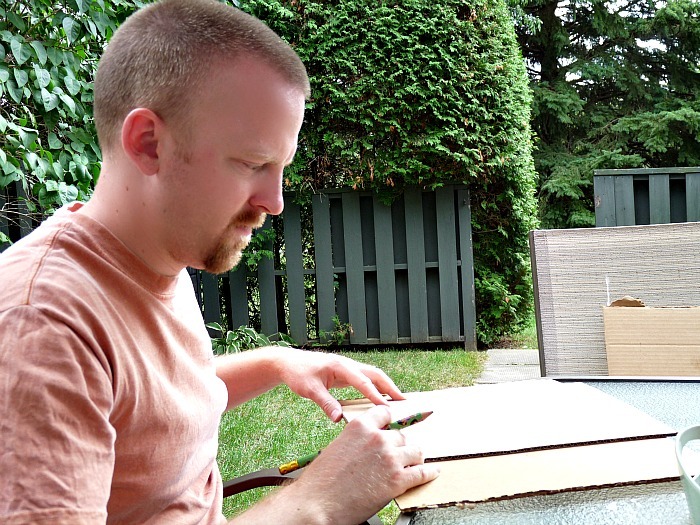 Hubby edits my work too – the blog included. He actually has the login, so he can change my (many) typos as soon as he spots them, lol. It can be hard being away from your spouse, but I am of the same mindset as you, it's important to do things on your own and remain capable and independent within the relationship. My husband used to be away for work for a month or more at a time, and while it can be lonely at times it's not necessarily unhealthy. I think being able to do things alone and to remain capable and confident far outweighs any loneliness. I know some couples where they depend on each other so much, and divvy life's tasks so down the middle, that if one spouse leaves (in one case, passed away), the other can't even find family phone numbers and or do the simplest things, because the other always did it. We've talked about this offline, but I also agree with the post & comments. My husband and I don't see each other all the time either – I have 2 jobs (and it's tough to start up a company, takes a lot of time and dedication), and he travels for work plus works long hours (he's actually back in DC today). We're both really independent people, and I think that's why these types of things work. It doesn't make it easier, and it doesn't mean I don't miss him, but I think having our own "things" and getting the chance to miss each other makes us stronger as a couple. You don't take little things for granted, that's for sure. PS – My husband also has an inordinate amount of pirate t-shirts! We must get them both to wear their pirate shirts when we get together, so they can look insane, lol. But let's not tell them. Just be awfully keen on the pirate shirt that day, "Ar, but this be a fine shirt to wear today".I just need Hubby to stop wearing at least one, because at the rate he loves on them they are getting holes EVERYWHERE! And, yes, I think missing the other person is important. Sometimes we'll get frustrated with the other but we won't fight. We know we don't have all the time in the world together, between working, travel, family, whatever. So we keep chill, and talk about it another day. Usually, lol. I married the first time when I was 18, and three months later, my husband went to Viet Nam for a year. It was one of the hardest things I've ever been through, but it was good for me too, because it made me very independent. After a divorce, I spent many years single, raising my daughter by myself. She and I installed light fixtures and garage door openers, painted the house, repaired plumbing and tore down fences. I have never really related to women who feek they have to wait till their husbands come home at night to hang pictures for them. I really enjoyed meeting you and your hubby, so I would love for you and your mom to make a trip to Texas. That would be so much fun!!! I look forward to your stories about her, and I would very much like to meet her. Can't wait to read about your husbands experience being home without you! Traumatized by the grocery store?! lolThe longest I spent away from "J" since we have been together was two weeks… However I think I should go away more often because my house has never been cleaner! (I think he was bored). I am so jealous!! Hubby's tidy, but he's bare minimum kinda tidy and I'm, well, I'm hand and knees scrub the floor tidy. I am so proud of you for doing this…. not sure that I could. 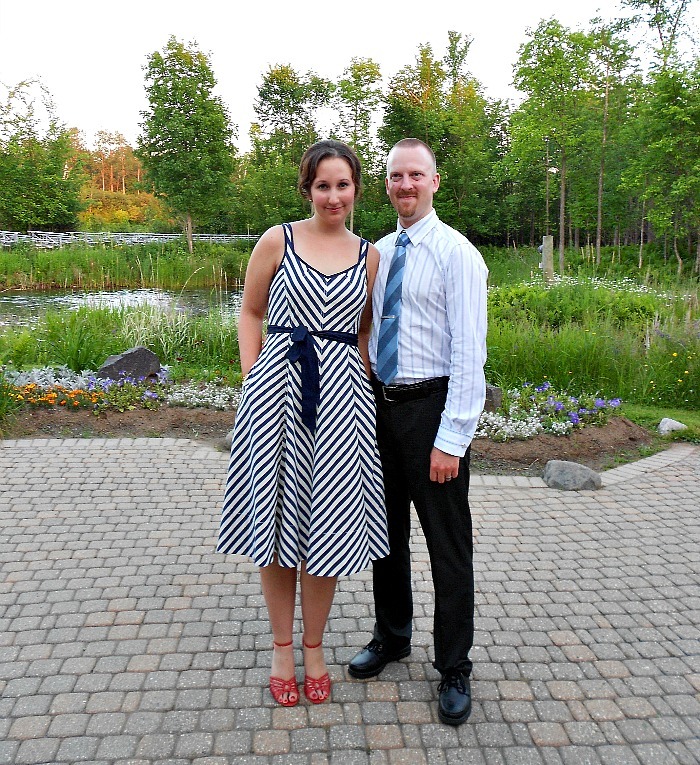 I do visit family for weeks at a time and my loving husband survives…. the house does not. Not sure if he will ever be house broken, but in the end that is not important what is is that we love each other. All of the rest is just the small stuff and you know what they say about that. Thanks 🙂 Sometimes I think it's such a small thing – I'm not so brave, but it's been a big deal for me. I know other people have done bigger and more impressive things, but this has been one of those things for me.It is nice that I haven't had to stress about the home. Any time my Mom left for a visit, my Dad would decide that taking the garbage out in small garbage bags was a waste of time. Instead, he's open a drawer and use it to prop open a big hefty bag, which he'd take out once it was FILLED. I always dreaded when my Mom left because my Dad, even with me as a child, around became a total teenager! I had a university prof say we are all out 13 year old selves. LOL. Great post! 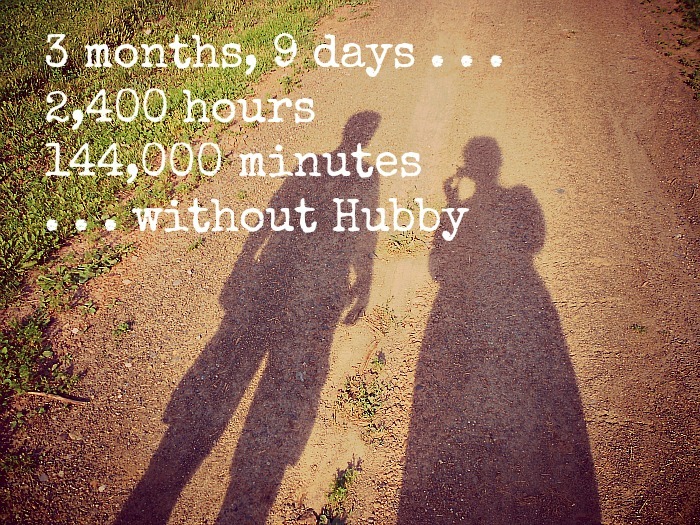 It's something readers wonder- how you cope without your spouse for 3 months. But giving it thought, I could do it too- just as you describe, you're busy, you're having an adventure… And I agree with having separate experiences to maintain your independence and keeping things interesting. I stay at home (homeschooling) with my kids and sometimes it feels like I haven't much to share about our day. However, I was single for a long time before I met my husband and I had lots of adventures, some that he's never heard of- occasionally, I still can bust out a story he's never heard. My husband was away for a month this sept and I was just fine (although that's not so long and we chatted on skype) because I could do all those things that I can't while he's home- staying overnight with the kids at a friends, lingering wherever we are, rather than rushing home to sit down to dinner, and messing up the house. In this case, I renovated our bedroom- painting, building a wardrobe/closet, light fixtures, rods & curtains, the works. I could make a big mess and just sleep on the sofa without worrying about where we would both sleep. He hates being away but I relished being 'temporarily single' again. It's not about having to answer to someone, but it's about being there when he comes home because I want to be. So, occasionally it's good to only worry about yourself (and the kiddos, of course). And the absence/fondness idiom is absolutely true. Missing someone is good to remind us of the things we love and forget about the small annoyances that don't mean anything in the big picture. Also, to those that wonder 'how you do it' but really mean 'why you do it'- few people question those that have to travel away from family for work. This is your work- yes you could choose not to do your PHD research but is not doing it because you don't want to be away from your husband for 3 months a good reason? People are funny, sometimes. Yes, I do think it's brave to leave for 3 months (perhaps not your-husband-away-at-war-for-a-year brave but still brave) but you have a career goal. Others shouldn't diminish your aspirations b/c they can't understand 'choosing' to be away from your spouse. Our thinking seems to be firmly locked into our traditional roles/expectations? Good on you!ps- I like that you do so much yourself but still let him deal with the centipedes. I'm much the same, a DIYer and doer of many unsavoury jobs but I let my guy take care of a mouse in the trap (ewww! )- ya know, so he can demonstrate his manliness! Unfortunately, where we live, mice are unavoidable- and I despise them so. I loved hearing about all the things you did while Hubby was away. I am so impressed you home school and still had time to renovate your bedroom on your own!! That is amazing. I am starting to think you might be one of those super-women, and I wouldn't doubt that you do indeed have very interesting stories – not just from before, either. I agree about the food: Hubs like to eat at certain times, certain foods (MEAT! he all but screams) but I am less concerned. I will work through dinner if I am on a roll and that freedom here has been nice. I am skipping a meal right now, lol.And, yup, I do seem to have some traditional folks in my life. Luckily, though, I also have people who are really open minded and just curious, not judgmental. But I am always happy to share my perspective on things, because I know sometimes how we live is a touch different.Hubby took care of the dead mouse in the wine bottle. Blech. And the one that died in his boot. I can't even type that without laughing. No, no, not superwoman. When I have projects on the go, something has to give, bigger piles of laundry or less sleep. And home school takes much less time than people would imagine since the kid to teacher ratio is 2:1 (in our case) and you can skip several days and catch up whenever, wkends, summer- very flexible. I laughed out loud about the mouse in the boot- BUT if it was in my boot, it would be a scream and a shudder. Ah yes, it took me exactly 13 months to wash a shirt Hubby wore to a summer wedding, so I understand about things giving. But, really, we all have too many clothes anyway! I do imagine home schooling takes a bit less time for the kids – but still oodles of prep and work for you! I love the idea of home schooling, by the way. Whenever I was home from school sick, I was always amazed at how much MORE I learned (both my parents are teachers) and how much better I understood the material. I'm not going to stop being amazed at you. Sorry :)I think I might have laughed if it was my boot, too, but only if I didn't find it with my foot. We found it via the smell. I'm just happy the stench was not coming from the boot itself. I left my boyfriend behind and went to Australia for a few months. We'd only been together for 4 months when I left and I'd already booked the trip before we met. He simply said "I'll be here when you get back" – how sweet!I had a ton of fun when I was there, but I was supposed to stay for 8 months and work, experience a different kind of life…but I realized that Australia wasn't where I wanted to be at the time. Everyone in their 20s goes there to party and sit on the beach (I'm not really that kind of girl) plus it's darn expensive there!So I came back after 2 months and my boyfriend and I moved in together, 2 years later I don't regret coming back early whatsoever, but of course my family still thinks I ditched my trip for loooooove. I think it's important to be your own person when you're in a relationship, so many people become melded to each other and totally reliant. You're so brave to have gone away to do something you were passionate about!! Just discovered your blog today and now I'm soaking it all up, loving it! Thanks so much for sharing your sweet story! I love that you ended up together and that even time apart, in the early stages, didn't make a difference. It's sounds like you found an amazing partner! !Thanks for saying I'm brave, but I just kind of found myself in the situation after a series of (happy) accidents. I'm also lucky to have such a supportive partner. Not every Hubby would have been so cool about it.